Packing Speed: 40 Cycles/min for Thermo-Forming. 35 Cycles/min for Cold-Forming. Feeding System: Auto feeding system by PLC Logic with pneumatic combination. Servo Drive Indexing: : Servo web indexing by rigid PLC Logic. Operator Interface: User friendly HMI touch screen (Human machine interface). 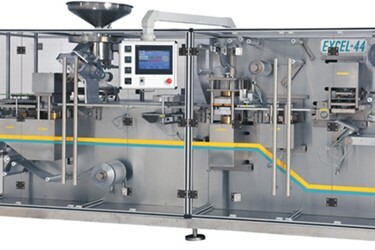 Pneumatic Operations: Festo make for fast response, oil free, minimum wear and tear, easy maintenance and universal availability of bought outs. Base Material: PVC / PVC-PVDC / ACCLAR / TRIPLEX / PP / ALU-ALU (OPA). Lidding Material: Aluminum with Heat Sealable Lacquer Coating.